The Acting Company has been touring the country for 40 years, bringing Shakespeare and other classic works of theater to cities from Decorah Iowa to NYC. The Acting Company has close ties to the Guthrie Theater, where it stops every January, and features many U of M/Guthrie BFA graduates. 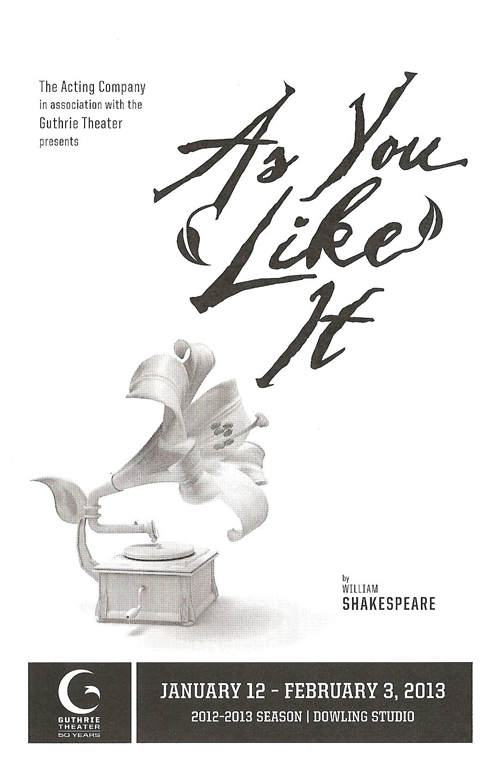 This year they're presenting As You Like It (which I saw just last year in a delightful interpretation by Ten Thousand Things). In case you get Shakespeare's comedies confused like I do, with their similar plots of banishment, disguises, and mistaken identities, let me remind you that As You Like It is the one where Rosalind is the daughter of a banished Duke, who escapes into the forest disguised as a man, where she convinces young Orlando to woo her as if she were Rosalind. And everyone lives happily ever after. 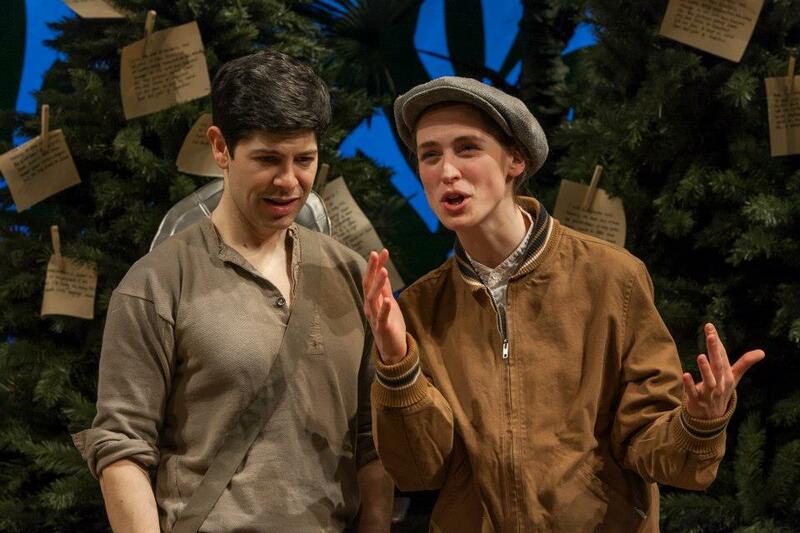 The talented young cast and the delightful staging bring this amusing story to life. Joseph Midyett and Elizabeth Stahlmann are convincing and charismatic as the young lovers Orlando and Rosalind, as is Megan Bartle as Rosalind's devoted cousin Celia. 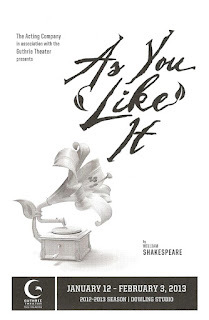 I'm beginning to think this might be my favorite Shakespeare comedy, mostly because of the inclusion of music, which is interpreted differently in each production I've seen. Here, we are treated to the lovely voice of Noah Putterman as the lord's musician Amiens. A couple of diverse performances, both equally enthusiastic and charming, are turned in by Michael McDonald as a refined courtier and a poor shepherd hopelessly in love. 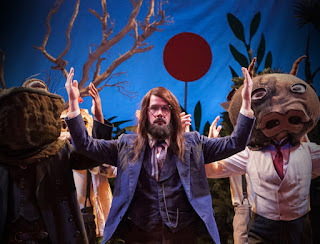 As the melancholy forest dweller Jaques, Chris Thorn (in long hair and a beard that makes him look like he's from the cast of Argo) very effectively delivers one of the most famous monologues in Shakespeare, the one that begins with "All the world's a stage, and all the men and women merely players," and then goes on to list the seven stages of man. I'm not sure what time period the costumes are supposed to be from, but they are interesting to look at. Celia's dress looks vaguely 40s-ish (and her adorable forest attire more like a Swiss miss), while Rosalind's wardrobe has a flapper-esque quality, and the men dressed in suits from sometime in the first half of the 19th century. Walking into the intimate studio theater, the stage is empty except for three standing phonographs and trees off to either side. At intermission, the stage is transformed into a magical forest. The phonographs are cleverly used to create sound effects and music, and the masks worn to represent animals in the forest are perfectly delightful.